Discover the charming Brit Hotel L’Hermitage, our hotel in Royan, ideal for a trip with your friends or family! 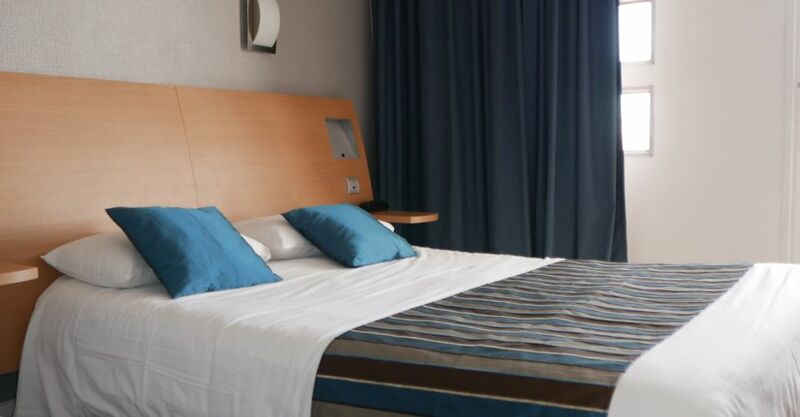 Our hotel is ideally located whether you come for a business or touristic trip: close to the beaches, the city center and the Palais des congrès. The Brit Hotel L’Hermitage’s reception is open from 7 a.m. to 9 p.m. outside these opening hours, a night watchman is there. You have the possibility to park your car in a free public parking near our Royan hotel. Our hotel also has a disabled access room. The Brit Hotel L’Hermitage has fully equipped rooms to guarantee that you have a great stay: a private bathroom with a shower and a bathroom and a hair dryer, free Wi-Fi and a flat screen TV with BeIn Sports. Every morning, start the day with great food! Our Breakfast buffet offers a selection of carefully chosen fresh and regional products from several local producers we collaborate with. A wide range of restaurants are open for lunch and dinner near our hotel. Our reception staff will be happy to advise you on the best places to eat at! Everyone is welcome at the Brit Hotel L’Hermitage! Bring your pet for an additional fee of 5 euros. Seduced yet? Spend some time in our hotel in Royan, you’re guaranteed to love it! A very pleasant stay for two nights. The owners are very welcoming. Even our dog enjoyed it!